Whenever you travel to a new city you want to have a real taste of what that city is all about. Experiencing new attractions and enjoying the city’s culture helps make any vacation more memorable. Miami is all about heat – from its tropical climate and sandy beaches to its spicy Latin American food. With so many attractions, restaurants and luxurious hotels to stay at you can always find something new when you drop by Miami and the surrounding areas. No matter where you are at you can find excellent transportation providers who are able to give you professional service from sedans, shared ride vans and for those wanting a little more style can travel in the popular SUV limos. Search for the best rate and then book your reservation at MIA airport today. Travelers can book for luxury vehicles such as limos and sedans or save as you go with shared ride vans. Offering shared ride van service for up to 10 passengers with quick trips to your destination with competitive low rates. As one of South Florida’s most popular names in shuttle and car service handles rides for travelers arriving at MIA airport. Book your transfer with a licensed and reliable chauffeur with private transportation from the airport. A popular black car service with upscale vehicles for any event or transfers for business executives. With flights throughout the Caribbean and many Latin American cities Miami International Airport has become one of the most frequently used airport for these popular southern destinations. It is also a popular location for those taking a cruise. The Port of Miami located close to the Caribbean islands and has direct routes to Mexico so travelers can find their favorite cruise ship, such as the Norwegian Cruise Line and Royal Caribbean International, when they depart from Miami. It is a busy airport serving the locals of Miami in the Southeastern end of the US. Since Miami is a favorite tourist destination because of its beaches, resorts, and party-filled environment, therefore people make their way here from all over the world. The airport has an international status, as it accepts flights from all around the globe. The airport has a huge structure and is one of the biggest in the area. 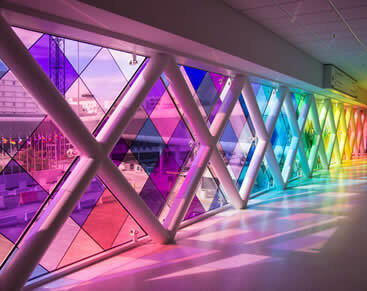 With a beautiful building, bright corridors, and artwork present all over the place, it is one of the most amazing and unique airports, you will find here in the US. The staff here is very active; as a result, you get to experience fast processing and easy security checking drills. Moreover, you don’t have any issues in locating your luggage as well. The only letdown this place has is that there is no free Wi-Fi service available. Had there been a Wi-Fi facility, this airport would have been a lot up in ranks, in the list of best airports in the US. It is placed right in the heart of the city. When you leave the building, you can easily locate beaches and other fun-packed places to spend your time at, if you have any from your flight schedule. Either you’re a local or not, you should come to see this beautiful piece of art at least once in your life. Miami International Airport is the primary facility that serves the greater Miami area, meaning guests will be more than likely to run into a large crowd when they arrive. Although pushing your way through the exit is a likely scenario, you won’t have to wait around long because SuperShuttle has a constant stream of shared ride vans, allowing for a quick and easy way to arrive to your final getaway. With incredible crowd-drawing activities like the tropical forests and exotic animals of the famous Jungle Island as well as the various pieces of art and antiques at Villa Vizcaya, Miami is an undeniably great place to take a group vacation. Arrive to these attractions and see much more of the famous beach city by reserving your own private van for the group trip. Contact us for the right information and how. Private vehicles can do wonders for a vacation, especially if you’re trying to visit a congested area. Whether it’s the incredible animal exhibits at Zoo Miami or an exhilarating basketball game at the famous American Airlines Arena, know that choosing a private sedan over public transportation can save precious vacation time. ExecuCar is one of Miami’s leading provider of comfort cars in the city, making sure each customer gets to their destination with a relaxed spine and a big smile. For fantastic family fun, book a private SUV from us today. Take the kids out to see Miami’s most amazing hotspots. Visit Bayfront Park, a beautiful park that makes up a green oasis near downtown, designed perfect for a day of long walks and picnics. Another awesome place for an afternoon adventure is the Fairchild Tropical Botanic Garden, a building so lush and beautiful, you’ll think you stepped into another world. Lucky for those in search for a night of elegance, the city of Miami is practical coated in luxury, whether it be the gourmet food at Michael’s Genuine Food & Drink or the unbeatable cocktails at the iconic Four Season Miami. Arrive to these locations like the pinnacle of success by reserving a limo ride with our providers of which offer limos that make anyone on board look elegantly intriguing. There are big groups and then there are supergroups which are anything past a dozen individuals, a number that makes it more difficult to travel around a densely populated city than usual. To accommodate your huge party, schedule a lovely chartered bus from area providers and have a daily outing in Miami’s famed museum district. Witness the shocking amount of global modern art at the sleek Perez Art Museum, and when you’re done feeling inspired, get a dose of history at HistoryMiami, a fun museum that offers daily tours about the city’s colorful history. If you are staying in the Miami Beach area on your next trip and you are looking for a unique experience then you are in luck. 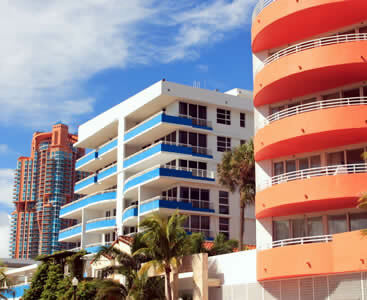 Miami beach has one of the best selections of luxury hotels in the world. Check out some of the best hotels and resorts you can find along the southern coast. → This historical luxury hotel is home to one of the best spas in the U.S., the Lapis Spa. This Lapis Spa has every amenity or spa treatment that you would expect from a top notch spa or salon. With rooms and suites that will amaze you from the moment you set foot in the door to a nightlife filled with music and dining like no other. → Near Lummus Park, this hotel is located in the middle of one of the most popular areas of the Miami’s famous South Beach. Loews Miami beach features oceanfront hotel rooms, including rooms in the historic St. Moritz Tower, are luxurious and spacious. The hotel also offers quick access to the Art Deco district of the city. → Located on Biscayne Bay, The Mondrian South Beach features a unique “floating staircase” that gives a new name to luxury. This oceanfront hotel has all of the amenities a guest could want such as a spa, a gym and bikes to use as well as a lounge designated for guests only on the marina. It offers breathtaking views and has a unique artistic vibe that guests find enchanting. → With an art deco design this hotel offers great nightlife and a luxurious pool on the roof with plenty of luscious landscape to give it a decidedly trendy look and feel. As one of the best hotels in Miami Beach you will find the location close to restaurants and the beach which many guests find very convenient. Spanning almost 40 acres, this Miami attraction offers plenty for the whole family to do and see. With animal shows and enough sea life to amaze children of all ages the Miami Seaquarium is a favorite for both locals and visitors of the area. 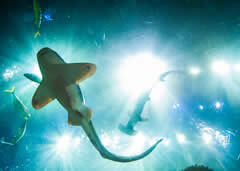 You can look, touch, learn and explore ocean animals like you never have before. This unique zoo is a tropical zoo and it is the only one of its kind in all of the United States. Zoo Miami features the Playworld Playground which offers both wet and dry playgrounds for children to cool off at. 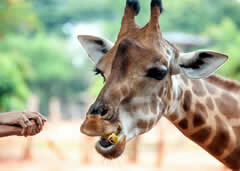 There are also animals you can ride, an amphitheater and even several locations where you can feed the animals. This is a must-see attraction while you are in town.